Solomon wrote in Proverbs that the fear of the Lord is the beginning of wisdom. This study will confront your students with this true, biblical definition, showing them how they can, with God’s help, apply His wisdom in each decision through high school and beyond. The Teacher's Manual Download includes . . .
Preeminently a book of principles, Proverbs provides the foundation from which the rules of life are drawn. 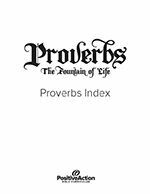 This study, Proverbs: The Fountain of Life, will confront your students with the true meaning of wisdom and how they can live by God's wisdom in every area of life. Note: A digital version of this resource is included within the Extra Resources packet for this study. This topical index of Proverbs is a sample of what students might include in the optional year-long project outlined in Lesson 1. Far from exhaustive, these passages instead reflect the most common and specific examples under each category. Compare your students' Proverbs Index projects with the passages in this sample.